The Mike Clink-produced album will hit stores January 25, 2019 via EMP Label Group. 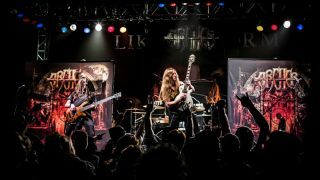 Santa Cruz, CA-based hard rockers Archer Nation have set a January 25, 2019 release date for their Mike Clink (Guns N’ Roses/Megadeth)-produced sophomore effort, Beneath The Dream. The album will be released via EMP Label Group. Check out an album teaser below. The band’s 2015 Metalville debut Culling The Weak, also produced and mixed by Clink, brought Archer Nation worldwide attention, having already toured extensively in over 20 countries, and performed alongside some of the genre’s biggest acts including Hellyeah, Annihilator, Doro, and Queensryche, as well as an appearance on the 2016 Monsters of Rock cruise. Bringing new meaning to the phrase “power trio” with the incendiary lineup of guitarist/vocalist Dylan Rose, bassist David DeSilva and Drummer Keyhan Moini, Archer Nation are determined to deliver genuine and unrelenting hard rock and heavy metal music to fans everywhere. Moini's unique and ferocious drumming, DeSilva's masterful bass duties, and Rose's captivating blend of shredding and powerhouse vocals make for an exciting modern take on the genre, while paying homage to all the inspirations that came before them. Says Rose, "After working together to create Culling The Weak, everyone was excited to get back in the studio with Mike for the second record. We're very pleased with the result and can't wait to release Beneath The Dream with the great team at EMP Label Group, so we can get back to non-stop touring in 2019!" To find out more, head over to archernation.com.